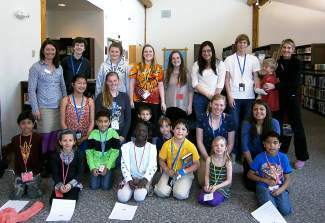 In April, 10 teen "Big Buddies" celebrated another successful semester of Reading Buddies with their young reading partners. Teen Summer Reading will ignite the creativity of local teens (ages 11-18) with an exciting eight-week program filled with activities based on fundamentals of science. Teens will be challenged to take a leap past conventional craft projects and create, build and experiment using new techniques and tools. The Avon Public Library’s Aero ‘dynamic’ Teen Science Fair will feature hovercrafts, hydrofoils and hot air balloons. Each branch will host a Makerspace session where teens take ownership of the supplies and devices around them and create independently. Teens looking to give-back to the will have the opportunity to donate creations to local charities and inspire younger kids as a helper or mentor. Avon: Tuesdays, June 3-July 29, 4 to 5 p.m. with Makerspace open until 7:30 p.m.
Eagle: Thursdays, June 5-July 31, 3:30 to 5 p.m.
Gypsum: Tuesdays, June 10-July 22, 3:30 to 4:30 p.m. with Makerspace open until 7:30 p.m. The Reading Buddies Program pairs teen volunteers with younger children (students in grades first to third) for an hour of one-on-one shared reading, once a week for eight weeks! Big Buddies (teen mentors in grades ninth-12) receive training at the beginning and throughout the session. In addition to the joy of helping a younger child read and succeed, teens are granted the opportunity to develop leadership, problem-solving and communication skills. Reading Buddies is a great volunteer experience for students to feature on resumes and college applications. Hannah Patterson, a Battle Mountain High School student and three-year Big Buddy mentor describes how her experience led to a future project working with youth: “After becoming a Reading Buddies volunteer, I began coaching rock climbing and now also work as a ski instructor for 3 to 6 year olds,” she said. Avon: Wednesdays, June 11-July 30, 4:30 p.m.
Eagle: Tuesdays, July 8-Aug. 12, 3:30 p.m.
Gypsum: Tuesdays, June 5-July 24, 10 a.m. The Eagle Valley Library District launched a mini book trailer and photo contest for teens on April 17 where participants choose to enter to create a 90-second video/slideshow about promoting one of this year’s nominated titles or to redesign and photograph a book jacket from the list of titles based on its story content. Prizes will be awarded in each category. Deadline for submission is Aug. 15. Official contest rules and video/photo guidelines can be accessed on EVLD’s “Teen Central” blog or with your local Teen Librarian. See Cathy in Avon, Dale in Eagle or Julie in Gypsum.